Empty Clip Studios, the developer of the 2012 indie hit Symphony, has announced that a sequel, Symphony Worlds, is in the works. The announcement says that players "must explore their music's worlds, discover the powers hidden within, harvest their resources and build the base they need to destroy the enemy." To make more sense of it, I took a closer look at Symphony on Steam, but it's not much help. 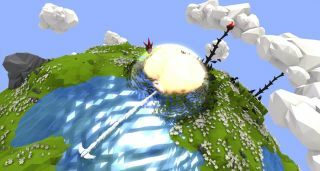 "Although it shares the name and takes place in the same universe," the developers wrote, "Symphony Worlds is a completely different game from its predecessor." So, to the textual description: Symphony Worlds will take place on tiny planets, entirely procedurally generated and destructible, and with a two-minute day/night cycle. Your music creates unique worlds, but they're being overrun by "mysterious demonic foes," and naturally, it's up to you to stop them. Music influences everything—terrain, vegetation, weather, and time—and it all has an impact on gameplay, somehow. The trailer is quite lovely, and given the success that Empty Clip had with Symphony—we gave it an 84 percent in October 2012—I'm optimistic, with the appropriate level of caution, for Symphony Worlds. A Kickstarter campaign is expected to take place this summer, and the studio hopes to have the game ready for release in early 2016. Find out more at SymphonyWorlds.com.